If you are seeking to add style and elegance to your home then let our team at Casa Blanca Granite, Marble & Tile provide our services to you. At Casa Blanca, we specialize in beautiful high-end materials that add style and value to your living space. We professionally install kitchen counter tops, bathtub enclosures, sinks, and fireplaces. All of our natural stones are man-made and unique. We pride ourselves in being on the forefront of current trends with our intricate selection of riveting materials. These unique mediums have long been considered visually striking, raw surface types, and for good reason. With so many captivating colors and tones to choose from, you will be left in amazement when selecting your very own granite, tile and natural stones. At Casa Blanca, we are committed to providing high-quality service and products that last. When we install counter tops in your kitchen or add granite details to your bathroom, we want to transform your space into one that will make you proud. Kitchens are often regarded as the heart of the home, so it is important to make it shine. 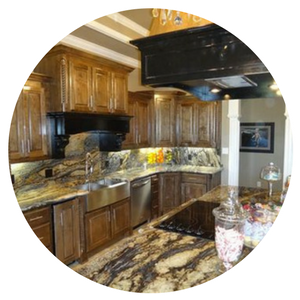 Let us install stunning granite counter tops, back-splashes and other unique details to create that "wow" factor that we know you will love. Nothing says luxury quite like a bathroom featuring sleek granite counters and other stunning touches. 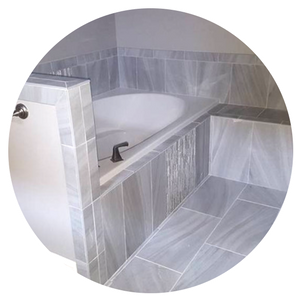 We can enclose your bathtub with this versatile material and even incorporate granite steps. 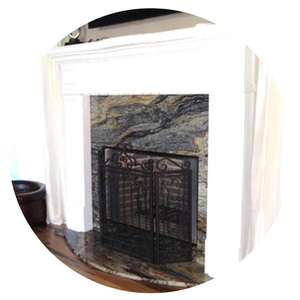 Take your fireplace to the next level by installing smooth, granite exteriors to the face of your fireplace. We promise it will add a touch of beauty that will make a statement.